These premium properties in Lancashire and Cumbria offer quality of life and superb value for money. Fig 1. The 55-acre Hay Carr estate at Bay Horse, Lancashire, includes staff flats, a gate lodge and a cottage. £4.25m. For the north-western counties of Lancashire and Cumbria, Britain’s longest motorway, the 257-mile M6 that runs via Birmingham, Manchester and Preston to the Scottish border north of Carlisle, is not only a major transport link, but an economic lifeline that has allowed a dynamic new generation of regional entrepreneurs to expand their businesses throughout the UK and beyond. But it’s not all one-way traffic, local estate agents point out, as they note the reappearance of home-buyers from the South, who are beginning to rediscover the quality of life and the value for money to be found in this often forgotten corner of England. The recent launch onto the market of the pristine, 55-acre Hay Carr estate (Fig 1) at Bay Horse, six miles from Lancaster and two miles from the M6, highlights not only the excellent value of property in these parts, but also the vision of the vendor—a successful businessman who bought Hay Carr in 1997 and has spared no expense in renovating it to the highest standards of comfort and design, says Crispin Holborow of Savills (020 7409 8881). He quotes a guide price of £4.25 million for the property, once part of a larger estate that included most of the surrounding land. The main estate house was built by the agricultural pioneer Thomas Lamb in 1750, with Victorian additions executed by William Lamb in about 1850.  Hay Carr has also been owned by the Sandeman family of Port fame. An impressive refurbishment of the entire property, reconfiguring many of the rooms, installing solid-oak flooring, re-wiring and re-plumbing throughout, installing a ground-source heat system and adding the Palm House and the adjoining library. Hay Carr has six sumptuous reception rooms, a vast kitchen/breakfast room, a palatial master suite, four further bedrooms, four bath/shower rooms, a cinema room, stores and cellars. Further accommodation is available in garden and groom’s flats in the stable courtyard, in the two-bedroom gate lodge and in the recently acquired Hay Carr Cottage, which sits alongside the picturesque Lancaster Canal that runs through the grounds. a six-person steam room. £1.95m. The gardens, surrounded by open parkland and well-fenced paddocks, have been beautifully landscaped and boast York-stone terraces, a walled garden, a rose garden, a kitchen garden, a maze and a wisteria walk leading to the splendid new summerhouse. And, to complete the grand picture, Hay Carr comes with planning consent for a new cricket pitch and a new pavilion. 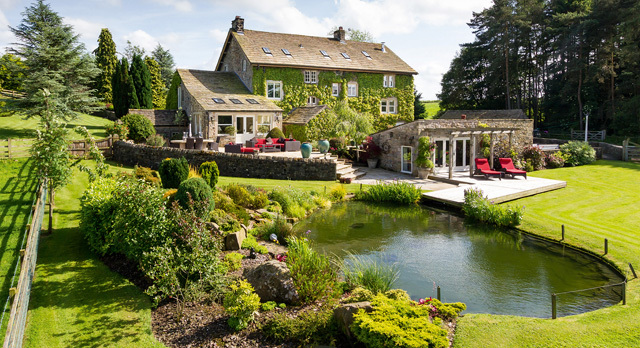 With its babbling brook and Coronation Gardens, the pretty village of Waddington, near Clitheroe, in Lancashire’s scenic Ribble Valley, is regularly voted the county’s best-kept village and is a magnet for well- heeled young families, many of whom commute daily to Manchester. Typical of the area’s dynamic business community are the owners of Grade II-listed Backridge House (Fig 2) in Twitter Lane, who have each developed and sold their own separate enterprises and now plan to build a new house nearby. Hence the sale of Backridge House through Smiths Gore’s new Clitheroe office (01200 411046) at a guide price of £1.95m. The vendors bought the handsome Georgian farmhouse with its 13 acres of gardens, pasture and woodland some eight years ago and, since then, have sympathetically restored and improved it, extending into the adjoining barn and adding a large garden room to the rear to make the most of the spectacular views over the surrounding countryside. Backridge House has some 5,445sq ft of accommodation on three floors, including four reception rooms, a large kitchen/breakfast room, four bedrooms, three bathrooms, a spa-treatment room, a gymnasium and a six-person tiled steam room. However, if fitness isn’t a priority, the leisure area could easily be converted to another substantial bedroom suite, suggests selling agent Justin Swingler. Across the county border in Cumbria, the town of Keswick, in the heart of the Lake District National Park, has been the focal point of tourism in the Lakes since 1769, when the poet Thomas Gray described the view of the town on the shores of Derwentwater as ‘the vale of Elysium in all its verdure’. Coleridge moved to the area in 1800, at about the same time as fellow Lakes poet Wordsworth. Since then, Keswick and its spectacular landscape have continued to attract artists, poets and writers, among them Beatrix Potter, whose sketches of local landmarks were used to illustrate her iconic children’s books. Fig 3. ‘This enchanted place’: Brackenburn at Manesty, Cumbria, was once home to the writer Sir Hugh Walpole. £1.45m. Selling agent Stephen Holland hopes to make it a double with the sale of another Keswick landmark, Brackenburn (Fig 3) at nearby Manesty, the home of the writer Sir Hugh Walpole from 1924 until his death in 1941. A prolific diarist and the author of the Cumberland family saga the ‘Herries Chronicles’, Walpole bought the house—built in 1904 from local Honister slate—in 1923 and enlarged and extended it, converting the upper storey of the nearby garage into a library and a study, which eventually housed his collection of 30,000 books. For Walpole, Brackenburn was ‘this enchanted place, this paradise on Catbells’, a sentiment echoed by its current owner, Christine Ellwood, a former Chief Dental Officer for Hertfordshire who followed her microbiologist husband north when he took up a research post at Durham University. 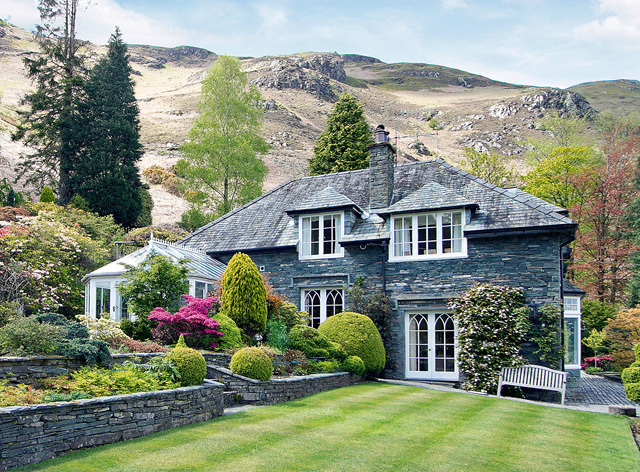 The couple bought Brackenburn 22 years ago and, since then, Mrs Ellwood has transformed the house and its wonderful landscaped gardens, which overlook Derwentwater towards Skiddaw. Carter Jonas (01539 814908) quote a guide price of £1.45m for the house, which has a galleried entrance hall, three reception rooms, a garden room, a kitchen/ breakfast room, four double bedrooms and three bathrooms. Fig 4. The Holesfoot estate, near Maulds Meaburn, Cumbria, is between the Lakes and Dales national parks. £1.6m. For total tranquillity, take the scenic route east from Keswick to Penrith, then go 15 miles down the M6 to Maulds Meaburn, described by the author and broadcaster Hunter Davies as ‘one of the most beautiful villages in the county of Cumbria’. 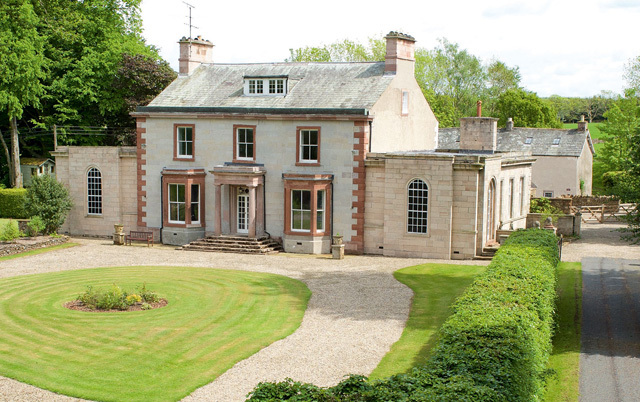 From here, it’s a mile to the charming Holesfoot estate (Fig 4)—a beautifully renovated, six-bedroom, early-19th-century house with 20 acres of formal gardens, wood- land, waterfalls and farmland—in the heart of the glorious Eden Valley, for sale through Penrith Farmers & Kidds (01768 862135) at a guide price of £1.6m. Sandwiched between the Lakes and Dales national parks, such is the quality of the landscape around Holesfoot that the area is currently the subject of a public inquiry, which may see it designated a national park, too.